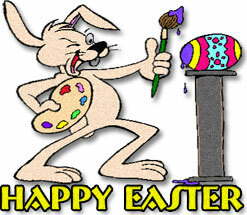 Free Easter graphics for your personal, educational and non profit web pages. 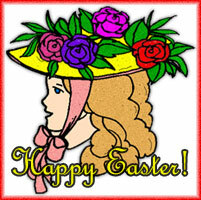 Easter clipart includes baskets, bonnets, chicks, bunnies, eggs and more. Happy Easter from a cute bunny. Brown basket with colored eggs and a bow. A bunny very happy about Easter. Easter eggs with chicks and stars. Bunny showing off his fancy eggs. Coloring Easter eggs for the big day. Easter egg with flowers, cross and animation. Animation of Easter bunnies in love. Bunnies with eggs and flowers plus animation. Colorful Easter eggs with glitter animation. Happy Easter with basket of eggs, flowers and glitter animation. Easter basket with white bunny animation. Easter bunny with flowers and a friend. Happy Easter with eggs, hearts and glitter animation. A bunny playing with Easter eggs. Perhaps he should cook them before adding color? Happy Easter bunny in an Easter basket. Easter bunny painting Easter eggs.